In a previous tutorial, we looked at the Background Eraser and why it's one of the best tools in Photoshop for removing unwanted areas of an image. In this tutorial, we'll learn all about the Color Replacement Tool and how it enables us to change the color of an object in a photo without a lot of fuss or hassle. You may be wondering what on earth a tool for erasing backgrounds has to do with a tool for changing colors, and the answer is, a lot! Both of these tools use the exact same technology for detecting the pixels in the image that need to be changed. The only difference is that one of them deletes pixels entirely, the other simply changes their color. In fact, they're so similar that if you've already read through the Background Eraser tutorial and understand how its various options work, learning about the Color Replacement Tool will seem a lot like déjà vu. The Color Replacement Tool is not the most professional way to change colors in an image and won't always give you the results you need, but it usually works well for simple tasks and it's such an easy tool to use that it's worth giving it a try before moving on to more advanced and time consuming methods. This tutorial is for Photoshop CS5 and earlier. If you're using Photoshop CS6 or Photoshop CC, you'll want to check out our fully updated Color Replacement Tool tutorial. The Color Replacement Tool was first introduced in Photoshop CS, and if you're using Photoshop CS or CS2, you'll find the Color Replacement Tool nested under the Healing Brush in the Tools palette. To access it, click and hold your mouse button down on the Healing Brush until a fly-out menu appears, then select the Color Replacement Tool from the menu. 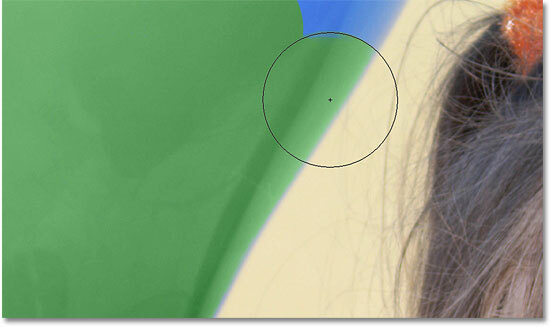 In Photoshop CS3 and CS4, the Color Replacement Tool is nested under the Brush Tool. In CS and CS2, it's under the Healing Brush. 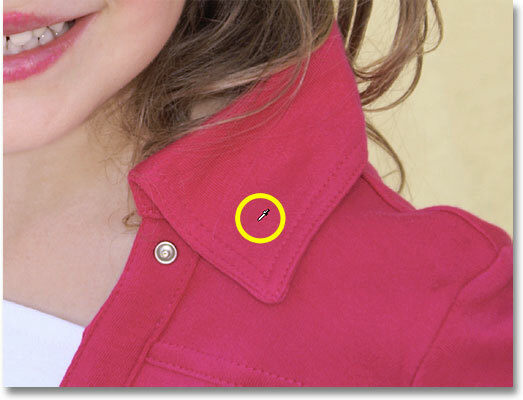 The Color Replacement Tool's cursor is made up of a simple circle with a target symbol in the middle, just like the Background Eraser. You can adjust the size of the circle directly from your keyboard using the bracket keys, which are found to the right of the letter P on most keyboards. Press the left bracket key ( [ ) to make the circle smaller or the right bracket key ( ] ) to make it larger. To change the hardness of the brush edges, just add the Shift key. Press Shift+left bracket ( [ ) to make the edges softer or Shift+right bracket ( ] ) to make them harder. 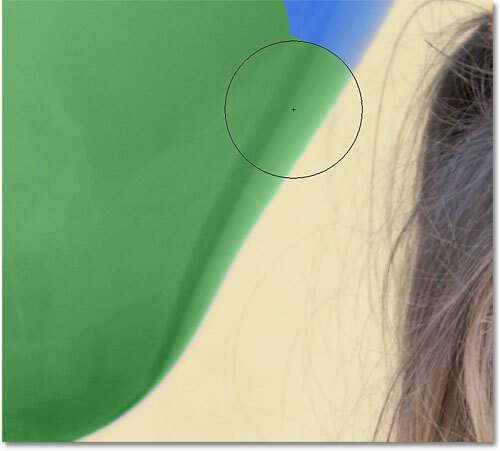 As you drag the Color Replacement Tool over your image, Photoshop continuously samples the color that's directly under the target symbol in the center of the tool's cursor. This is the color that will be replaced, and it will be replaced with your current Foreground color. Any pixels that fall within the larger circle surrounding the target symbol that match the color being replaced will have their color changed. 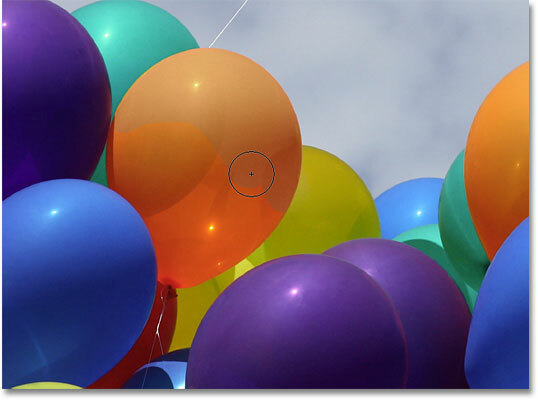 For example, if you pass the target symbol over an area of blue in your photo and your Foreground color is set to red, any blue pixels that the larger circle passes over will be changed to red. There's some options we can set in the Options Bar to alter the behavior of the tool (which we'll look at shortly), but essentially, that's how it works. The newly chosen color appears in the color swatch. Keeping the target symbol over the blue area as I paint. 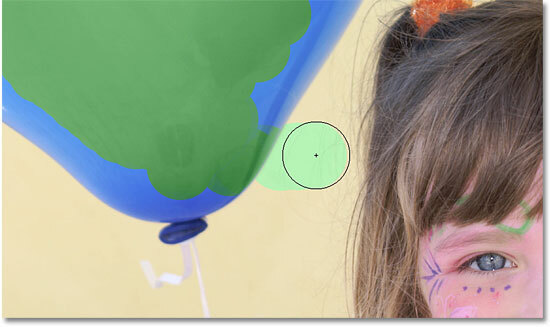 By moving the target symbol outside of the balloon, Photoshop starts replacing other colors with green. If this happens, simply undo the last step by pressing Ctrl+Z (Win) / Command+Z (Mac), or undo multiple steps by pressing Ctrl+Alt+Z (Win) / Command+Option+Z (Mac) as many times as needed, then continue on. I mentioned a few moments ago that there are several options available to us in the Options Bar for altering the behavior of the Color Replacement Tool, and one of these options is Tolerance. The Tolerance setting determines how different a color can be from the sampled color for Photoshop to replace it with the Foreground color. The default value is 30%, which is a good starting point. 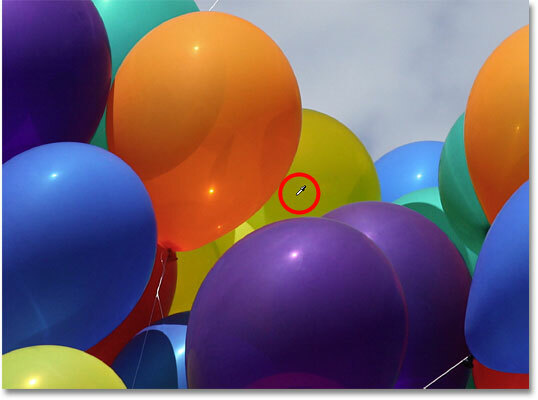 Unfortunately, it's not quite high enough in this case for Photoshop to be able to include the shade of blue right along the edges of the balloon. 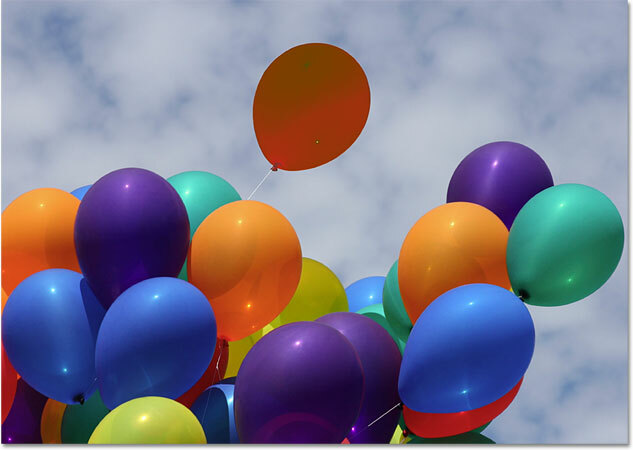 The Color Replacement Tool was able to change the balloon's color with little effort. 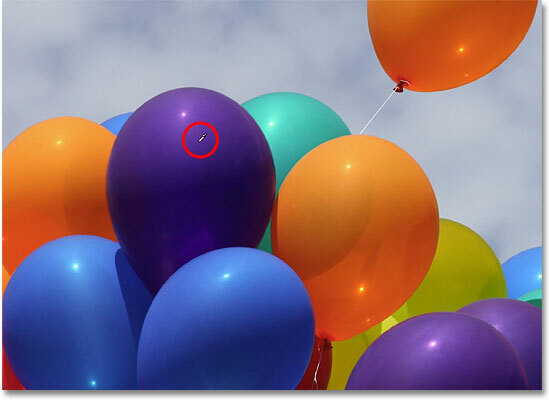 Notice that even though we've essentially painted a color over top of the balloon, it retained its shiny, reflective appearance. If we had simply grabbed the regular Brush Tool and painted over it, the balloon would look like nothing more than a flat surface with no life to it. 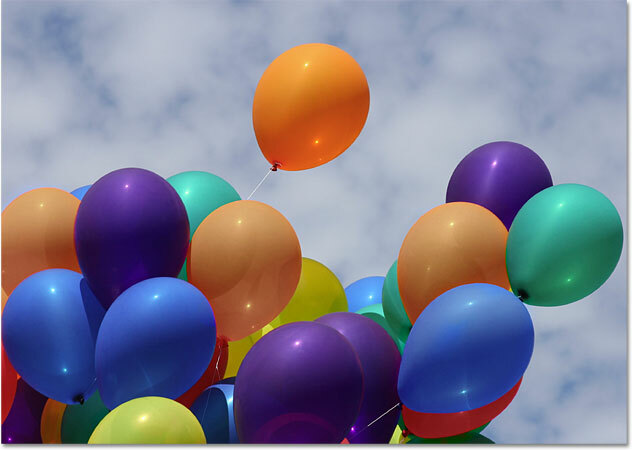 So how was the Color Replacement Tool able to keep the balloon's texture and reflections? For the answer to that, we need to look at more of the options in the Options Bar, which we'll do next! If you've ever taken a Color Theory 101 class, you probably know that what most of us think of as the color of an object is really a combination of three things - hue, saturation and brightness. 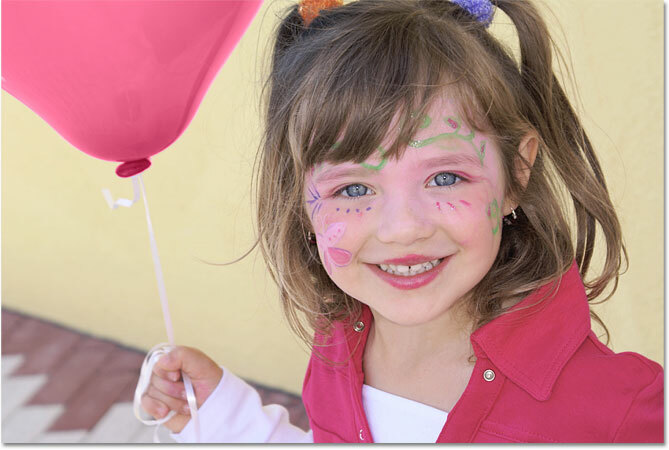 Each of the four blend modes we can select for the Color Replacement Tool will change which of these three aspects of the original color will be affected. There's one situation, unfortunately, where the Color Replacement Tool tends to fail miserably, and that's when there's a big difference in brightness between the original color in the image and the color you want to replace it with. Let's say I wanted to replace the orange in that one balloon we've been focusing on with the dark purple color from one of the other balloons. From everything we've seen so far, it should be simple enough, right? Sampling a purple color to set as my Foreground color. I think it's safe to say that things did not go well. The Luminosity blend mode definitely made the balloon darker, but it's still orange, and now most of the texture detail is gone! It barely looks like a balloon at all at this point, and this is the problem we face with the Color Replacement Tool. It works great for simple tasks where you only need to change the hue and/or saturation of a color, but if there's too much of a difference in brightness values between the original color and the new color, you'll probably want to try something else. These sampling options control how Photoshop samples colors in the image as you move the target symbol over them, or if it samples them at all. With Continuous selected, Photoshop continually looks for new colors to replace as you drag the Color Replacement Tool around. Any new color the target symbol passes over becomes the new color to replace. This is the setting you'll use most often and works best when there's a lot of variation in the color of the object. With Once selected, Photoshop will only sample the color you initially click on regardless of how many other colors you drag over (as long as you keep your mouse button held down). This option works best if you're replacing a large area of solid color. You can also try the Once option if you find that Continuous is causing the Color Replacement Tool to bleed into other nearby areas and the Tolerance option doesn't seem to help. Finally, you won't use it very often (if ever), but the Background Swatch setting will replace whatever color is currently set as your Background color. This option may prove useful if neither of the other two sampling options is working for you. Click on the Background color swatch in the Tools palette and select a color from the Color Picker that matches, as close as possible, the color in the image you want to replace. Try adjusting the Tolerance value if the color you chose wasn't quite close enough. 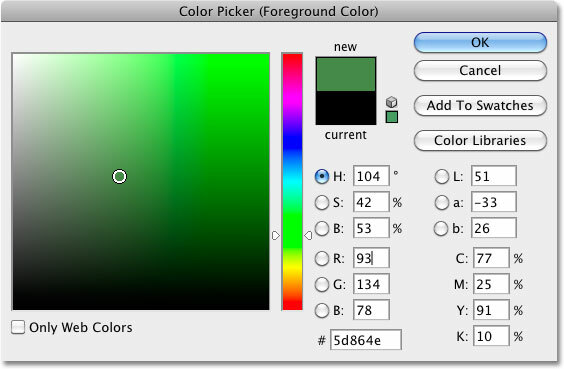 The default setting for the Limits option is Contiguous, which means that the Color Replacement Tool can only change the color of pixels in the area the target symbol in the center of the cursor is touching. It won't affect pixels that match the sampled color but are separated from the target symbol by an area of a different color unless you physically move the target symbol into the new area. The opposite of this is Discontiguous, which allows the Color Replacement Tool to replace the color of any pixels that match the sampled color and fall within the boundaries of the cursor, whether those pixels are in the same area as the target symbol or not. And there we have it! That's how to change the color of an object in a photo with the Color Replacement Tool in Photoshop! Check out our Photo Retouching section for more Photoshop image editing tutorials!